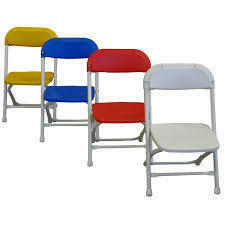 Folding chairs for kids, just like Mom & Dad! Our kids chairs fit perfectly with our kid's size tables and are sized to fit most kids from 1 to 6 years old. Available color: white, red, blue and yellow.